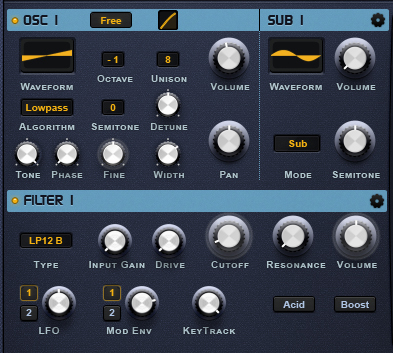 An Incredible True Wavetable Synth With An Intuitive Workflow & Fantastic Sounds! 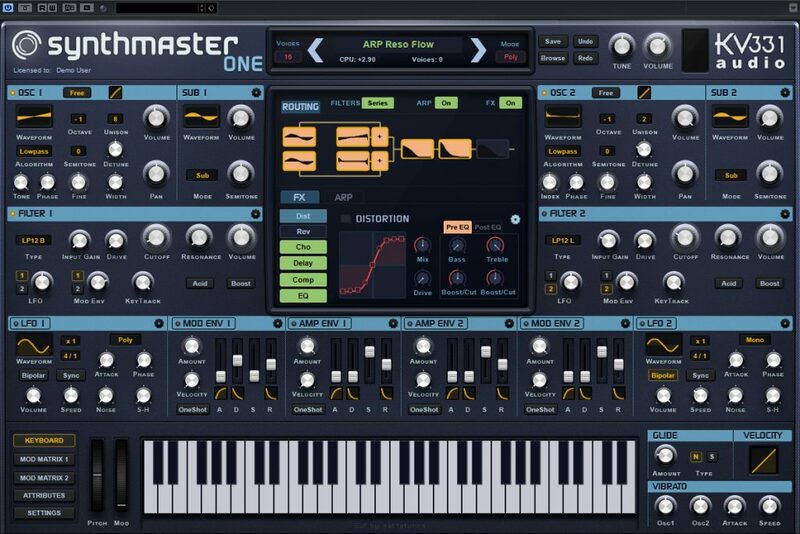 With dual wavetable oscillators, stunning filters and fast-paced interface, “SynthMaster One” sounds fantastic and stays out of your way while you work! 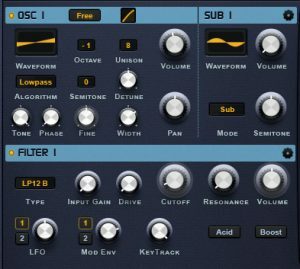 Not only does “SynthMaster One” sound amazing, it also supports switchable skins/interfaces for a completely customisable look, and several of them are included! Get Inspired With Over 650 Presets & Incredible Sound Manipulation Tools! “SynthMaster One” comes equipped with an easy to understand yet powerful interface, a massive amount of presets to draw inspiration from and also true Wavetable Synthesis abilities which open up new possibilities for sound design. 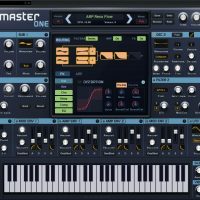 SynthMaster One’s architecture is intuitive and easy to negotiate, but boasts enough flexibility and depth to deliver a limitless range of electronic sounds. It consists of two Oscillators with associated Sub Oscillators, the mixed outputs of which feed into two Filters, which in turn output to one or two envelope modulated amplifiers, followed by a series of master FX. The signal flow between the oscillators and filters can be reconfigured using the Filters menu here. For example, if you want to see all trance-appropriate sequenced mono Factory presets by Aiyn Zahev, select the Factory Presets, Aiyn Zahev, Sequence, Monophonic and Trance entries in the five browser columns. A Sound that’s Uniquely Yours – Voices, Oscillators & Filters! Polyphony Mode – Three voicing configurations are available, selected from the Mode menu at the top of the interface: Poly, Mono & Legato. 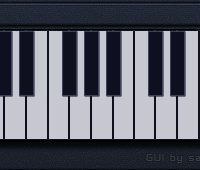 Glide – In “Mono” and “Legato” modes, the Glide knob (at the right hand side of the Keyboard panel) determines the time it takes to slide from one note’s pitch to the next. Glide Type – The two Glide Types available here; “N”ormal and “S”lide, affect the way overlapping and consecutive notes are handled. 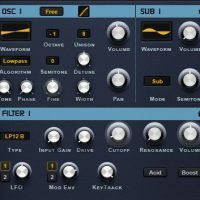 SynthMaster One’s two stereo oscillators are capable of loading standard analogue-style waveforms, as well as sampled single-cycle waveforms and wavetables. 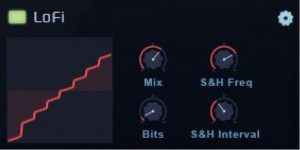 Starting with version 1.0.5, you can drag and drop wave files/folders containing single cycle waveforms or wavetables onto an oscillator waveform display. Ladder Filter – Modeled on the famous Moog ladder filter, with a choice of two slopes (12dB/octave and 24dB/octave) and four filter types (Lowpass, Highpass, Bandpass and Bandstop). Diode Ladder Filter – Modeled on the well-known analogue filter circuit of the Roland TB-303. Includes only one filter type: Lowpass with 24dB/octave slope. State Variable Filter – Modeled on the analogue state variable filter found in the Oberheim SEM. This one’s available in four types: 12dB/octave Lowpass, 12dB/octave Highpass, Bandpass and Bandstop. Bite Filter – Modeled on the 12dB/octave Lowpass. For a more in depth read of the full capabilities of “SynthMaster One” read the User Manual HERE. 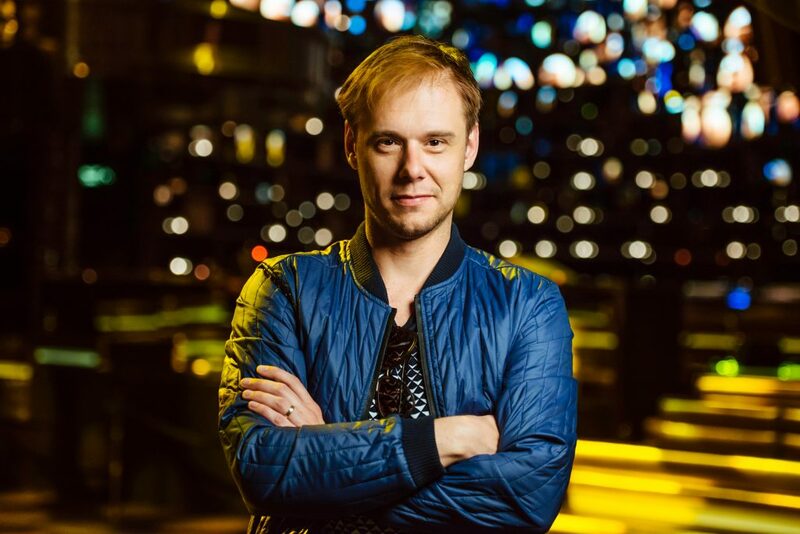 Bring Your Sounds To Life With Modulation, Arpeggiation & FX! 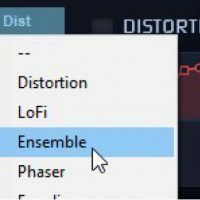 As you would expect, “Synthmaster One” provides plenty of ways to add interesting space and movement to your music. 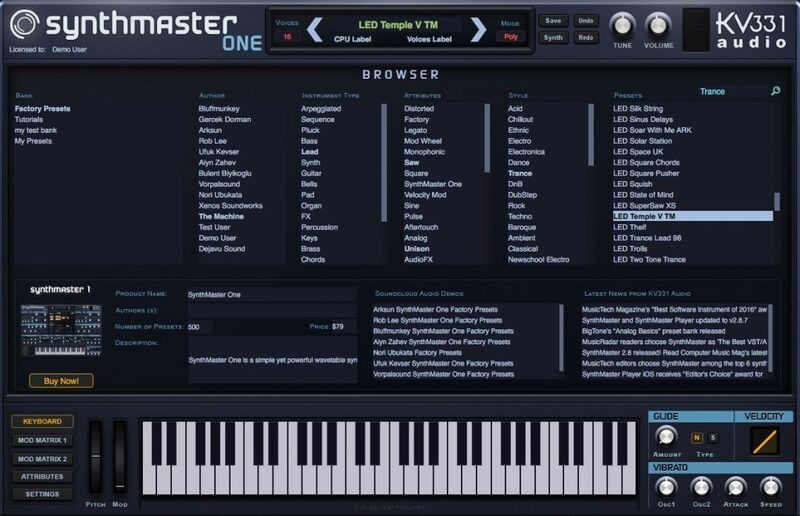 “SynthMaster One” features a very powerful Arpeggiator/Sequencer with up to 16 steps. Each step has it’s own Velocity, Length, Slide, Hold and Delta (Arpeggiate mode only) settings, and Note number(s) (Sequence mode only). Using the Arpeggiator/Sequencer, you can create rhythmic arpeggios and polyphonic sequences. The Arpeggiator receives MIDI input and sends MIDI output. The signal flow through the FX section runs from the top of the ‘rack’ to the bottom. 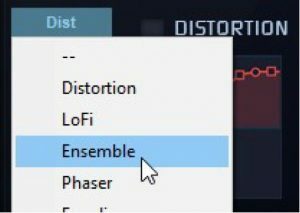 To load an effect into one of the six slots or replace a loaded effect with a different one, right-click the slot and choose a module from the menu. 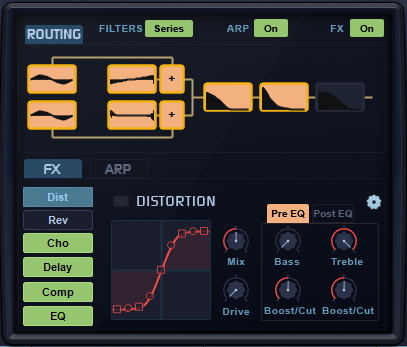 Distortion – 2-band shelving EQ followed by a distortion stage, followed by another 2-band shelving EQ. Lofi – applies bit depth and sample rate reduction (through sample and hold). 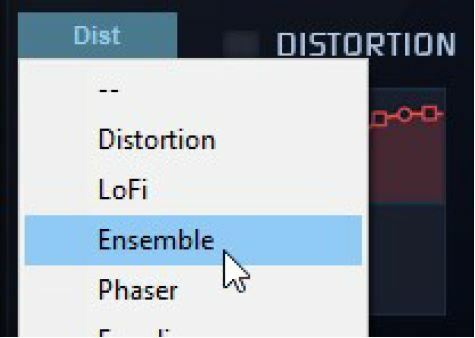 Ensemble – generates up to six ‘unison’ voices in parallel at different delay modulations. Phaser – a 4-, 8-, 12- or 16-stage analogue modeled phaser. 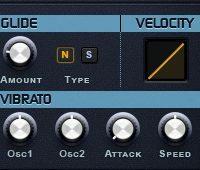 Equalizer – a 6-band EQ, editable using the knobs and/or by dragging the filter nodes in the display. Vocoder – consists of 16 analysis and 16 synthesis filters (1 LP + 14 BP + 1 HP). Delay – a stereo delay effect with built-in 2-band EQ. Chorus – the Chorus effect adds time variable delays to its stereo inputs. 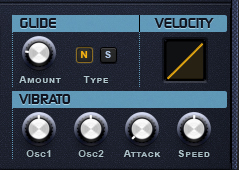 Tremolo – modulates the amplitude of its stereo inputs based on the movement of an internal stereo LFO. 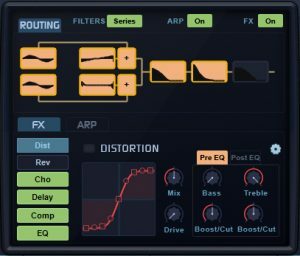 Reverb – a powerful Reverb effect, used to simulate rooms and spaces. 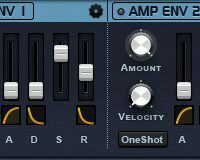 Compressor – used for dynamic gain reduction, automatically lowering the output level in response to changes in input signal gain. 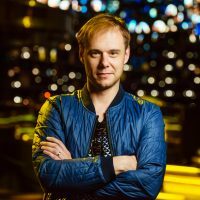 So What Exactly Can I Do With “SynthMaster One”? 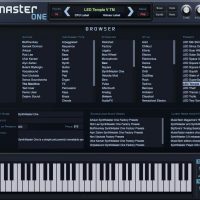 With it’s unparalleled flexibility, “SynthMaster One” opens up a whole new world of sound design possibilities for your next track, thanks to it’s huge collection of Oscillator, LFO and Modulation controls, as well as the fully featured Arpeggiatior/Sequencer and Effects rack. 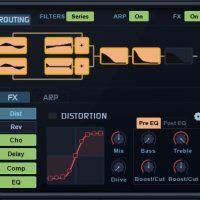 "SynthMaster One does a superb job of transferring the essence and spirit of its epic stablemate over to a more hardware-style single-screen interface, resulting in a quintessential ‘workhorse’ instrument tooled up for all kinds of patches. 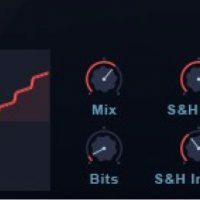 With dual wavetable oscillators, stunning filters and fast-paced interface, SynthMaster One sounds fantastic and stays out of your way while you work!"